The cause of the Woolsey Fire that killed three people and destroyed hundreds of homes in Malibu in November is still under investigation. But a group of more than 100 property owners allege in a lawsuit filed this week that Southern California Edison and Boeing failed to protect the public from the threat of wildfire. The lawsuit, filed Tuesday in Los Angeles County Superior Court, claims Edison ignored Red Flag warnings by not shutting off power to prevent downed lines from sparking a fire. (It had warned thousands of customers that it might cut off power, but only flipped the switch on 114 customers after the fire started). Citing a Los Angeles Times review of radio transmissions from the fire, the lawsuit accuses Boeing’s private firefighting efforts of being “wholly absent,” as the city and county battled the blaze. And it accuse each company of not clearing vegetation, near Edison’s equipment and at Boeing’s 2,850-acre Santa Susana Field Laboratory in the Simi Hills, where the blaze erupted on November 8. It is at least the seventh lawsuit Edison faces over the Woolsey Fire, and appears to be the first for Boeing. Lawsuits against the utility company started rolling in November 15, six days before the inferno was fully contained. The Woolsey Fire is the most destructive wildfire in Los Angeles County history. 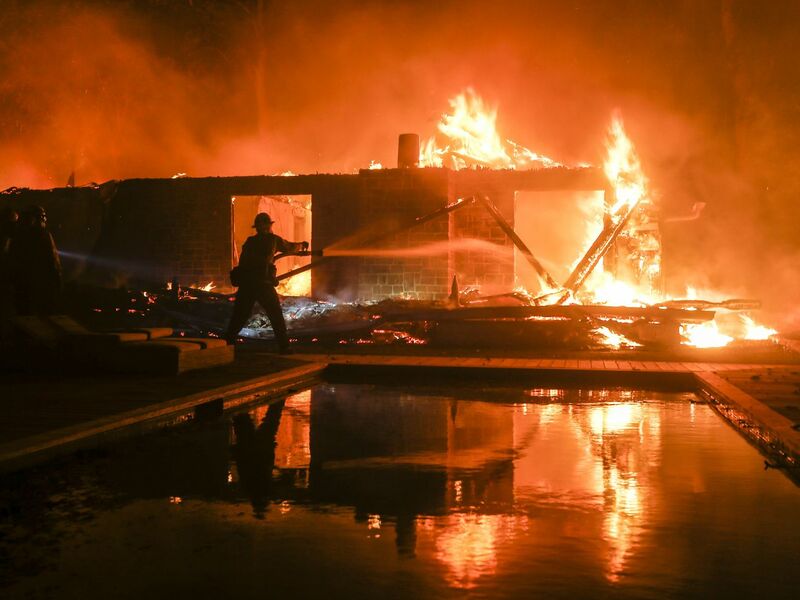 Pushed by strong Santa Ana winds, flames swept rapidly from canyons to shoreline, and, over the course of several days, consumed 96,949 acres and torched more than 1,500 structures in Ventura and Los Angeles counties. Edison later determined what might have triggered the so-called relay. After inspecting the circuit, crews found a guy wire, which is used to support power poles, “in proximity” to a jumper, which is used to connect two energized lines. CalFire and Edison are both investigating whether the guy wire and jumper made contact, and what role—if any—that might have had in igniting the Woolsey Fire. Edison declined to comment on the lawsuit. Boeing said its “security and fire personnel stationed at Santa Susana immediately responded when the fire was first reported and also promptly notified firefighting agencies.” The company declined to answer specific questions about its firefighting operation and response. Correction: An earlier version of this story stated that Edison’s Chatsworth substation is located in Chatsworth. The Chatsworth substation is located within Boeing’s Santa Susana complex.